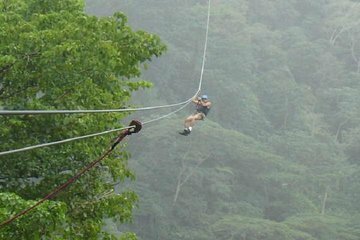 One easy booking gives you two perspectives on Puerto Limon’s wildlife with this canopy zipline and Tortuguero Canals boat tour. A guide helps you spot wildlife like sloths and turtles as you sail through the canals, followed by a hassle-free transfer to a canopy tour with 12 cables. Top off your tour with a visit to a panoramic vista point, where you stop to admire the views.